Welcome to Tutorial Tuesday! 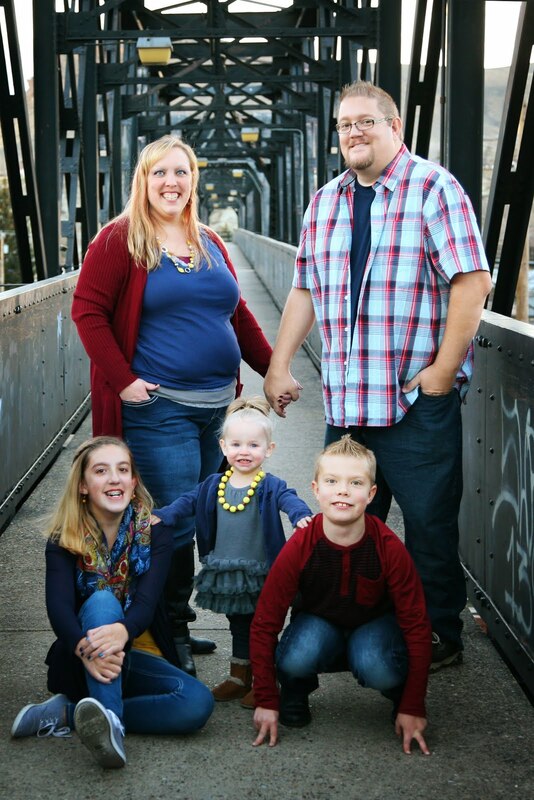 I've decided to make one day a week special and post a tutorial for you -- either one of my own tutorials or one I found in Blogland that I have tried or want to try -- hopefully to give you some inspiration and encouragement to try new things! 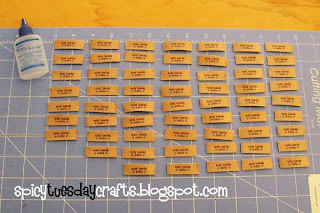 And so, without further ado, here's our first tutorial: Do-It-Yourself Sew-In Labels! First, I should say that I thoroughly searched online for instructions for this one. I know that many, many places sell custom labels that you can order, but I wanted to save some $$ by making them myself Several of the sites I found suggested getting this special fabric that you run through your printer, but I didn't like that idea because my poor old printer doesn't like anything that doesn't "feel" like paper and rewards my attempts with giant bursts of ink in the most unfortunate places. 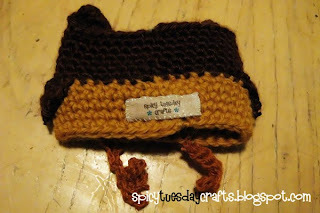 I did find one tutorial over at http://www.patchworkpottery.blogspot.com/ that I really liked, mostly because the labels could be washed without losing the image and made with materials you can find almost anywhere. This tutorial is based on my trials and errors, and tips I found helpful along the way. Enjoy! Step 1: Create your design for your label. I made my image larger than I planned to print it so the resolution would be good when it was reduced in size. Also, the image had to be "mirrored" so it would show up correctly on the iron-on paper. 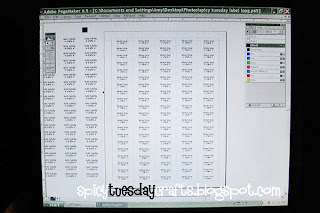 Once I got the design to look exactly how I wanted it, I created a layout page in Adobe Pagemaker (I know, a really old program but it still works for what I need it for) and repeated the design. 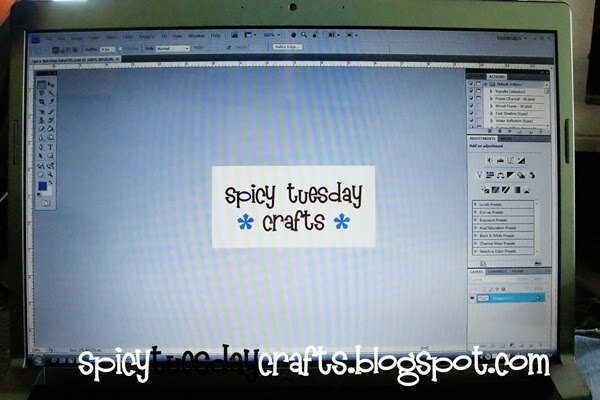 I was able to fit 100 separate labels on one sheet of the transfer paper, and each design is just under 1/2 inch tall. Step 2: Follow the instructions on the transfer paper to make sure the images will show up properly. 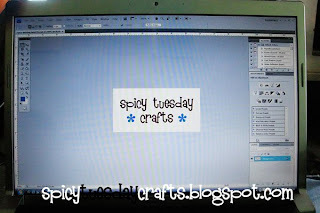 I used these Light Fabric Transfers specifically because the transfer material is clear. Avery also makes another type called Dark Fabric Transfers which is great for printing iron-on photos, but the transfer material for those is white. This is great for the photos because the colors show up really nicely, but it doesn't work for making labels because the area around the letters in the design comes out white and the ribbon/twill tape gets covered up completely. 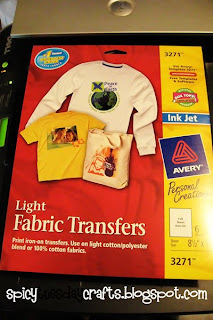 Also, it may help to print the layout of the designs on a plain sheet of white paper to make sure you like the way it all looks before you print on the transfer paper. Just a thought -- like I said, trial and error. Step 3: When your layout looks good and you've printed it on the transfer paper, cut them apart into strips. I used my rotary cutter and a ruler to get the strips straight and only 1/2 inch tall. 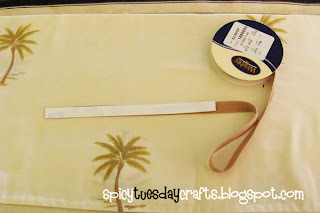 Step 4: Unroll a stretch of the twill tape and iron on one of the label strips. Again, follow the directions on the fabric transfer package. I found it to take about 30 seconds of heat to get the label to stick properly. 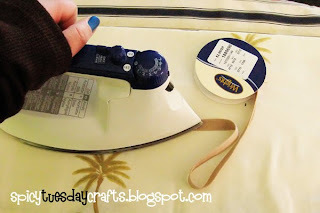 Cut off the piece of the twill tape you just ironed so you only have one strip to work with at a time. DO NOT TAKE OFF THE PAPER BACKING UNTIL THE STRIP HAS COOLED COMPLETELY! I can't stress this enough -- if you try to peel the paper backing off while the twill tape is still warm, it will take the design off with it! I found it better to do only one strip at a time so it was easier to line up the strip onto the twill tape. I wanted my designs to sit straight so working in smaller pieces helped. Also, the strips I cut were almost exactly the same length as my iron so I didn't have to move the iron around too much, thus keeping the design from sliding around on the tape. Step 5: When all the strips have been ironed onto the twill tape, and are COOLED COMPLETELY, peel off the backing paper. 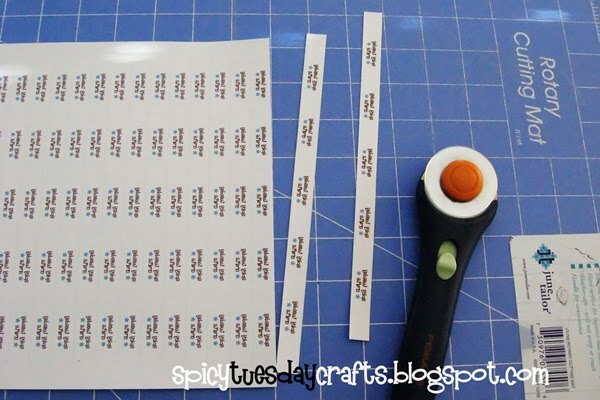 You can then either leave them as a roll on the twill tape spool and cut them off one at a time or cut them apart into individual labels and store them in a jar or cup. 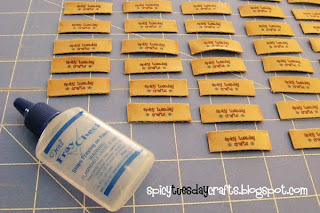 Before sewing the labels into your projects, use the Dritz Fray-Check to keep them from unraveling at the cut edges. Apply a thin line of the Fray-Check along both of the cut edges and allow to dry completely. 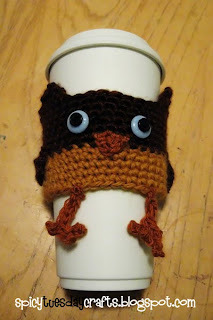 This little guy happens to be a coffee cup cozy for an upcoming post. Stay tuned! 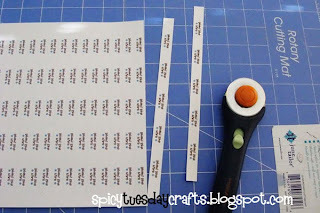 The labels pictured in this tutorial are made with the 1/2 inch wide twill tape. I also made some with 1 inch wide labels using the same instructions and 1 inch wide twill tape, and was able to fit 40 of that size onto one transfer sheet. Give it a try, and let me know if you have questions!